Without Target, this article would not be possible, so, first, a thanks to Target® as the sponsor of the Iditarod Teacher on the Trail™ position. Its sponsorship is the reason I am writing for this E-runner. From assistance with cold weather gear to transportation to lodging to the opportunity to experience the Iditarod firsthand so I can authentically bring the race to teachers and students around the world, Target has made it possible. Target’s commitment to literacy and its connection with the Iditarod show that this corporation is “right on target” with education. So many memories come jumping out at me when I think about writing about the race and the experience. Chronological order is the best way to organize them. The Junior Iditarod, teams coming off the Yentna River arriving at the roadhouse for their layover. Teens setting and pulling snowhooks with the ease of much practice and foretelling their futures in the mushing world. Early morning at 3 a.m., so cold that moving was essential to warmth, teenagers up at that hour, feeding dogs, hooking up harnesses, packing up gear, teams dashing down the cut trail to the Yentna River, starting the homeward leg of their race. At dawn, the curve of the new moon hanging over the trees on the riverbank, its pale light contrasting with lightening dawn. Anticipating Jeremiah Klejka’s surprise when he realizes what we all know what he does not know—that he is first to finish. Fast-paced Skwentna—the teams are still bunched together at this point, so many volunteers direct mushers to food, to straw, to water, to their parking place, and all this starts in the dark, continuing through the night. By late morning, all the teams but three are gone, a fishbone skeleton outline of straw beds on the river. Nikolai for a few hours- a visit with Ms. B’s class who is excited about the mushers coming to Nikolai. Their autograph books hang in the gym where mushers and visitors can buy moose stew or mushers stretch out on the gym floor pads to sleep, despite noise and light. Martin Buser hooking up his team, game face on, intent on leaving Nikolai to be first into McGrath. The volunteer veterinarians working their way through each team, with exams, scratches, and rubs for each dog. Flying out of Nikolai with five dogs, including a canine co-pilot in the right seat, for company and warmth. The dogs look out the window to see where their pilot is taking them, then lie on my legs and feet for a short snooze on the way to McGrath. McGrath, a busy hub, with logistics organizing the Iditarod Air Force planes and volunteer pilots, the backbone of the race’s transportation of volunteers. I get there early enough to see the trailbreakers come through, putting in the trail ahead of the first teams, and I’m early enough to see the first musher, Martin Buser, pull in and out of McGrath on his way to 24 in Takotna. Takotna to meet more teachers, more students, more villagers. Norwegian students in reflective parking vests valet park teams as they arrive throughout the village between homes, the community center and post office, along the road into Takotna edging the river bank. Kristy Berington and her leaders with dawn’s early light touching their faces. Fourseater planes landing and taking off on the river with cut evergreen branches sprouting from the snow to form the landing strip outline. In a hurry to get back to the river for an outbound flight, sprawled in the snowmachine sled on top of gear and Iditarod Insider camera equipment bags, HANG ON and ZOOM! Down the river bank. Anvik where Hugh Neff reaches us first to take the First to the Yukon award, $3500 of cash in a goldminer’s pan and a five-course meal cooked on hotplates. His GPS tracker showed an early morning arrival time, and we all rolled out to greet him, then John Baker, then Lance Mackey. The time spent waiting for Hugh was passed with listening to Ken Chase, an Anvik elder who ran in the very first Iditarod, his voice betraying his passion for the event, even now. More teachers and students in Anvik, a young boy studying Lance closely as Lance booties up his team, the apprentice watching the master. Children caring for the pup who thought she should run from Shageluk to Anvik because she saw Aliy Zirkle’s team running on the river. Squashed in the back of Dave Looney’s plane, on top of gear with gear on top of me for quick trips to Shageluk, Grayling, Eagle Island, an outpost of nothing but what volunteers set up for camp, Kaltag and the nearly straight-up climb from the river to the village, to Unalakleet for the first shower in about four days. Another hub of logistics and people crossing paths. By now, I am greeting people I met earlier on the trail as we all move to our next villages and checkpoints, just ahead of the first mushers. Koyuk, where I pitch in moving HEET to the Dodge Lodge, wash the spaghetti with caribou meat sauce dishes, and greet the first five mushers from late evening to 3 a.m. John Baker arrives first, and the villagers crowd into the checkpoint for his arrival (they are following the GPS trackers on their home computers) and stay, to be near John. Speculation begins—Will he be the first Eskimo to win the Iditarod? The Koyuk hillside cemetery painted pink in the rising sun’s light, simple crosses moving me more than eloquent marble. Young boys footracing Mike Williams, Jr. and his team as he comes off the ice. White Mountain, flying over John and arriving just before he does for the mandatory 8 hour layover. Now, unless something unusual happens, John will win, although Ramey Smyth is second and literally has a track record of making the fastest times between here and Nome. Will it be a foot race? Nome, where it all finishes, but not until all are finished. Not a contest that ends with the first contestant to get there, but one that ends when the last athlete arrives, under the burled arch. A contest recognizing the work, the time, the effort, the perseverance to complete the thousand mile Iditarod. From John Baker to Ellen Halverson, now the race is complete. Spring is bursting out all over here, and classes are enjoying hearing about the 2011 Iditarod. Patriot Elementary students saw cold weather gear and asked questions about the race and the dogs. This school held two Idita-Reads, one for kindergarten through second grade and one for grades three through five. I Skyped with the Red Lantern classes, the classes who kept reading, persevering to finish their school’s Idita-Read. A first grade at Mt Pleasant Elementary School enjoyed following this blog, the videos, and the pictures, especially the one taken from the air. These students compared the temperatures in Alaska to their temperatures and charted the temperatures. 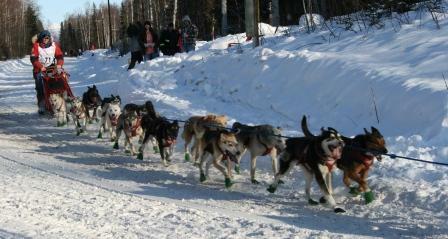 They followed the progress of the mushers during the race, too. I followed up their activities with a classroom visit, bringing my cold weather gear, showing pictures of the race, answering questions, and, their most favorite, showing a dog bootie to pass around and fit their little hands inside. Mount Pleasant Middle School students followed the race, moving their mushers along a gigantic race map in the school’s display case, reading blog updates, and measuring the temperature on a thermometer made by the school’s art teacher. They compared temperatures, discussed the weather patterns of their state and Alaska, and how the seasons change. This school participated in an Idita-Read with students reading a book per mile and earning prizes like Iditarod shirts and books. Hands fit in booties, too. Cold weather gear swallows up a first grader. Illustrated thank you card depicting the Target 2011 Iditarod Teacher on the Trail riding in the sled. Comms volunteer, Nancy, uses a walkie talkie to receive and confirm information from the race checker upon a team's arrival in Eagle Island. How many forms of communication did you use today? Generate a list. Were all of the forms on your list electronic, or did you include forms like sign language, writing, or speaking? Make a chronological list or timeline of the development of all the forms of communciation you used in one day. Now, think about how quickly or slowly these forms of communication worked. Did you have to repeat any of them in order for the person receiving them to get the communication? 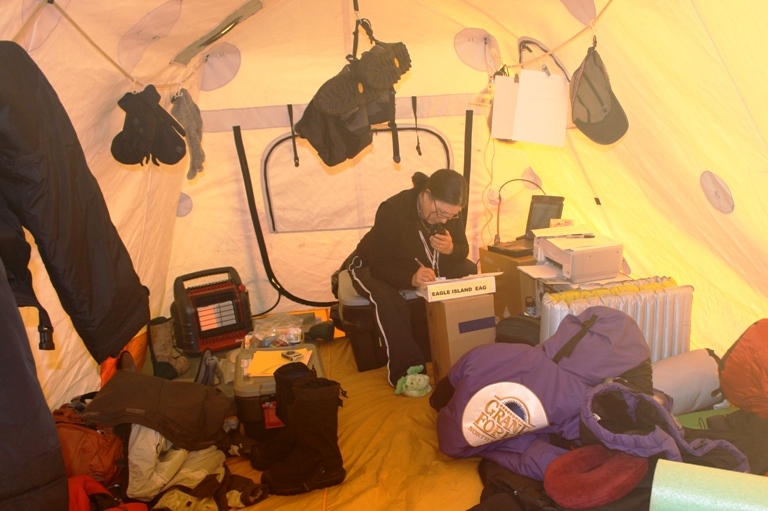 During the Iditarod, a group of volunteers works a job called Comms, for Communications. Comms volunteers work at every checkpoint and send information such as musher arrival or departure dates and times and the number of dogs they arrive or leave with to the Comms department in Anchorage. This process is how the race standings are updated by the Anchorage Comms volunteers. Comms also communicates messages from people at the checkpoints to others elsewhere. In Alaska, Comms is challenging. The Iditarod runs through remote Alaska, and after leaving Willow at the start, the race is off the road system, as they say in Alaska. That means there is no road connecting the villages and checkpoints; flying, snowmachine, or dogteam are the only ways to reach them. The remoteness affects communciations–race checkers and checkpoint Comms volunteers may use walkie talkies to communicate arrival and departure information to each other. Using cell phones to transmit race details to Anchorage Comms is not reliable because there isn’t cell service in all areas; Internet service may be available via ethernet cable connection or wireless, but usually it isn’t wireless. Sometimes the Internet is only accessible by satellite, and sometimes a sat phone (satellite phone) is all there is to use, like in Iditarod checkpoint. In Eagle Island, information is sent by data sat–that means a satellite phone is attached to the laptop and an antenna outside the Comms tent gets satellite signal to transmit the communication. In a day and age when people are accustomed to almost instantaneous communication, this could seem to be a delayed process. And, all of us who use email or text messaging have experienced sending a message which disappears into who knows where, and the intended recipient doesn’t receive it. My phone was off and packed after Skwentna because it didn’t get service; no phone for me for about 3 weeks. I used ethernet cable and wireless at other places, and in a couple of places, there was no Internet for me to use because it was more important for Comms to access it than me. And, I got down to basic communication as well, just asking and talking, instead of calling or emailing. In the photograph, notice the heater and laptop in the tent. Clothing is hanging in order to dry–wearing sweat-soaked clothes in cold weather chills the body, something to be avoided. Find out why this should be avoided and explain it to someone else. Last night the last group of volunteers, except those working in the dog lot in Nome where teams rested awaiting their flights home, returned to Anchorage. The group included cooks, dog handlers, vets, trail sweeps (people who follow the end of the race on snowmachines), Iditarod Insider crew, ITC employees, and me. Monday found me at Nome Elementary School and the Head Start program presenting to all the grade levels. The school is a beautiful building and is filled with student projects including hatching salmon and bulletin boards of newspaper clippings about the Iditarod. Monday was a windy day with snow falling. By recess, though, the snowfall had stopped. Students played outside on the playground equipment and pushed snow around into piles with their hands, as if in a sandbox making sandpiles. Compare and contrast your recess time with the description and photos of the Nome Elementary recess time. After being interviewed by a high school student and visiting with a high school English and journalism teacher in Nome, I was dropped off at the church where I’ve been staying and I packed my gear bag, readying it and me for the flight to Anchorage. This isn’t my last post, though, so return to the blog to read new posts. 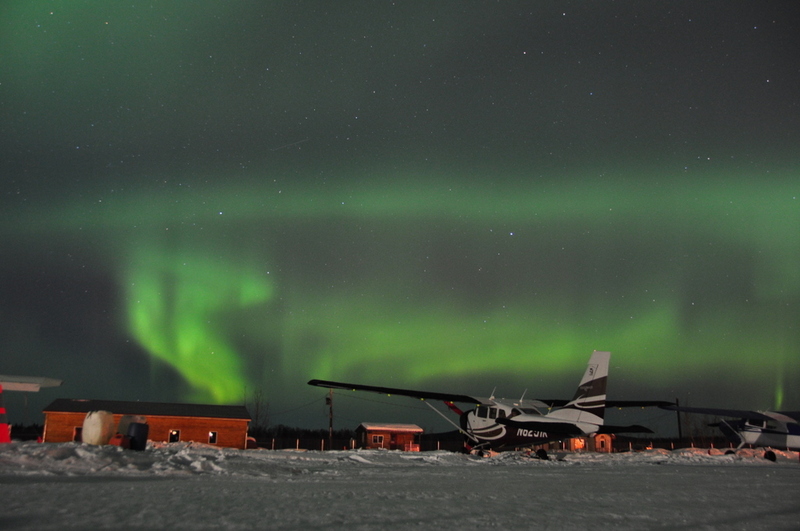 In Takotna a week ago, the Northern Lights appeared brightly, shimmering green. A friend sent me photos he took of them that night; to photograph these, a tripod is necessary because it’s difficult to hold a camera still enough. This site, http://www.gedds.alaska.edu/auroraforecast/, gives aurora borealis forecasts as to how “good” the night’s show will be. The night I saw them, the forecast was a 4. These lights are a natural light display in the sky, caused by the collision of charged particles directed by earth’s magnetic field. They are especially easy to see in the polar regions. The Northern Lights were named after the Roman goddess of dawn, Aurora, and the Greek name for the north wind, Boreas. The science of these lights involves photon emissions from ionized nitrogen atoms which regain an electron and oxygen and nitrogen atoms changing from an excited state to a ground state. Solar wind particles excite, or ionize, these atoms when they collide. Oxygen emissions produce green or brownish-red lights and nitrogen emissions produce blue or red lights. 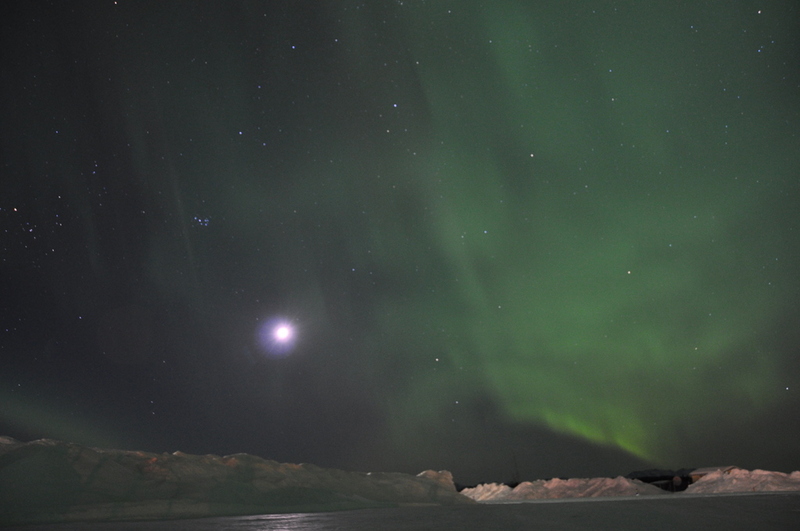 Chemistry classes—research this light phenomena, illustrate the process by which it happens, visit the site above for information on the Northern Lights. View the previous post for a video of Wattie’s team in Anchorage. The photos in this gallery show were shot with the sport setting of the camera, capturing Wattie’s arrival in the chute in Nome.